Console players had a great time during our Double XP event the other week. Now, the time has come for our PC players to rank up faster. During Saturday and Sunday this weekend (May 26th-27th), every point you make gets doubled at the end of round! Battlefield 3 fan site Battlefieldo is reporting that the upcoming DLC "Close Quarters", featuring four new maps plus additional weapons, will be $14.99. We've got some exclusive news and some new dates for you all. It looks like EA/DICE is rolling out a premium content service, and are also planning to drop 5th expansion after their previously announced End Game DLC. 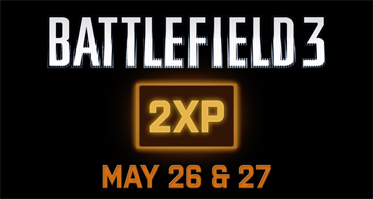 In addition, there will be a DOUBLE XP WEEKEND this weekend, May 12th - 14th! Battlefield 3 Servers & Stats now available on GameTracker.com! The game is going live within the next 24 hours and our server list is now populating with the new official version! Add your BF3 server today! Battlefield 3 servers are now being scanned by GameTracker.com!